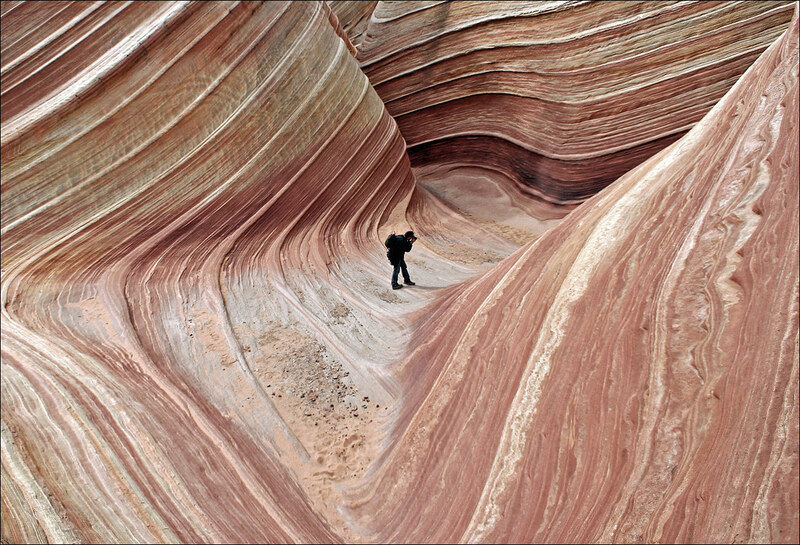 The Wave is located on the Colorado Plateau, near the Utah and Arizona border. The area is a gallery of twisted sandstone, resembling deformed pillars, cones, mushrooms and other odd creations. Deposits of iron claim some of the responsibility for the unique blending of color twisted in the rock, creating a dramatic rainbow of pastel yellows, pinks and reds. Reaching The Wave is about a 5.5 mile round trip trek from the Wire Pass parking lot. On average, it takes roughly six hours (round trip) and trail usage is limited to 20 people per day with no overnight camping allowed. See here for complete route information and here for a detailed route map. The Wave is situated within the Paria Canyon-Vermilion Cliffs Wilderness, a 112,500 acres (455 km2) wilderness area located in northern Arizona and southern Utah, USA, within the arid Colorado Plateau region. The wilderness is composed of broad plateaus, tall escarpments, and deep canyons.